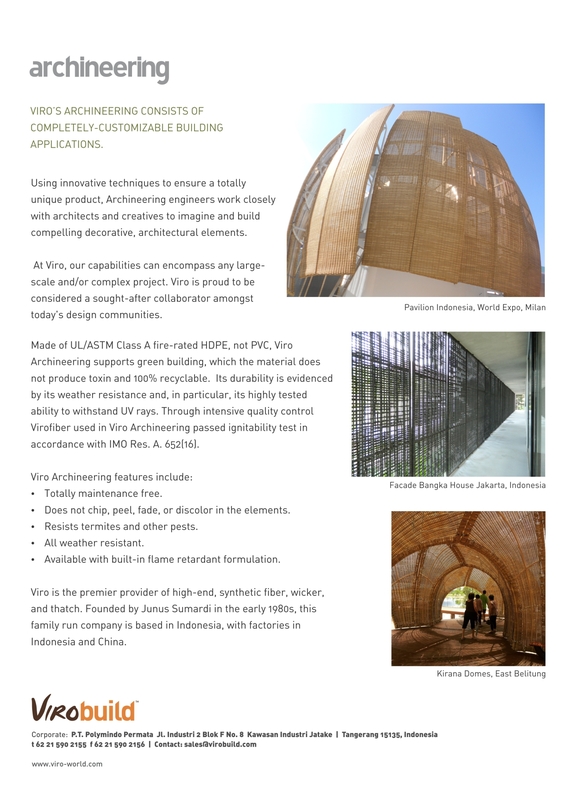 Viro’s Archineering consists of completely-customizable building applications. Using innovative techniques to ensure a totally unique product, Archineering engineers work closely with architects and creativity to imagine and build compelling decorative, architectural elements. At Viro, our capabilities can encompass any large-scale and/or complex project. Viro is proud to be considered a sought-after collaborator amongst today's design communities. Made of UL/ASTM Class A fire-rated HDPE, not PVC, Viro Archineering supports green building, which the material does not produce toxin and 100% recyclable. Its durability is evidenced by its weather resistance and, in particular, its highly tested ability to withstand UV rays. Through intensive quality control Virofiber used in Viro Archineering passed ignitability test in accordance with IMO Res. A. 652(16).